As a professional in the assisted living industry, I am up on the latest news about end of life care. I have seen more articles on this topic during this past year than ever before in my 20+ year career. I am happy about the wide range of people writing about and getting involved in this issue. From physicians to hospice care nurses to colleagues in assisted living, professionals are slowly speaking out breaking down the taboos around discussing end-of-life concerns. The well-known journalist Ellen Goodman has now provided a very pragmatic way for individuals to start having conversations about their own life’s end based on our commonly held desire to be more in control over our own deaths and to ease the uncertainty and guilt of loved ones left behind. Her project and website “The Conversation Project” is well worth reviewing. It provides a roadmap and specific questions to help us prepare for a conversation with loved ones and doctors about what we want for end-of-life care. It isn’t about filling out Advance Directives or other medical forms. It offers a much more personal and thoughtful way to begin thinking about end-of-life care. I used Ellen Goodman’s Conversation Starter Kit to kickstart a conversation with my 83-year-old mother and 81-year-old aunt about their end-of-life wishes. What I didn’t realize at the outset was that I would end up getting so much out of it for myself in terms of thinking about my own death and how I could prepare myself and my own immediate family for that eventuality. When it comes right down to it none of us knows who is going to die first. We all assume it will be the elders in our families but sometimes accidents and health issues take younger family members first. This isn’t morbid; this is reality. Therefore, I highly recommend the Conversation Starter Kit no matter what age you are. My Mom, Aunt and I each prepared for our discussion by printing out the Conversation Starter Kit and answering the questions for ourselves. The questions are simple yet get at the very heart of the issue. “What is most important to you as you think about how you want to live at the end of your life? (I personally like the emphasis on “live”.) What do you value most?” The kit is an actual worksheet and you finish sentences, such as “What matters to me at the end of life is….” I filled in this blank with “that I am with my family and I am able to converse with them until the end; that I am not hooked up to so many tubes that I can’t hug or be hugged.” Powerful stuff. Just the act of writing my answers down crystallized my thoughts. As my Mom, Aunt and I had our conversation it played out mostly as I imagined it would. 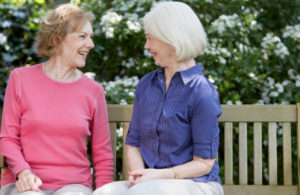 They are both strong, pragmatic women who don’t hesitant to talk about these issues, and, because I work with seniors, I am also fairly matter of fact about discussing end of life issues. Our conversation was not emotional. I imagine, though, that it could be very emotional for some, especially for families that have personal issues or conflict to settle. I would also bet that if I were to have a serious conversation with my teenage daughters or my husband about my or their end of life it would probably become very emotional. But that would give us an opportunity to talk about our love for eachother. Tough and wonderful at the same time. My Mom and my Aunt both expressed a strong desire to keep on living. Their lives are full. They have families, friends and many interests. They were both very clear on their wish for thorough information from their doctors and hospital personnel about the impact of any extensive end-of-life care that might be recommended. They don’t want to be passive; they want to have a key role in making decisions. My Aunt, who now has several stents following a second heart attack, said her doctor told her that there was a good possibility that if she goes into cardiac arrest again and is not resuscitated immediately she would, most likely, survive but with brain damage. This, she said, is not the way she would want to live. She would not want to be resuscitated in this case. The next step for her, my Mom, and me is to put specific wishes like this into writing. We will review our living wills and update our health care proxies if we need to. I plan to ask them if they have or want DNRs (Do Not Resuscitate) orders on file with their doctors. We need to do some research to determine if there are any other forms to fill out. 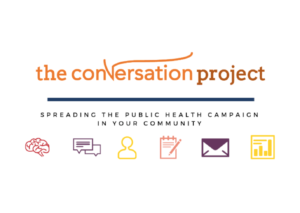 The next step in the Conversation Project is to print out the “How to Talk to Your Doctor” starter kit and begin the conversation with our PCPs (primary care physicians). I’ll keep you posted how it goes! 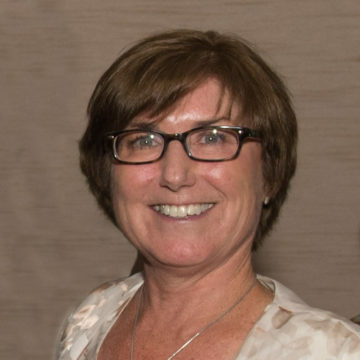 But, for now I am happy to be one of the 27 percent: A national survey conducted by The Conversation Project in 2013 showed that 90% of people say that talking with their loved ones about end-of-life care is important; yet only 27% have actually done so.